Petra was a group often cited as one of the pioneers leading the way in the realm of the Christian rock and contemporary Christian music genres beginning in the 1970’s. Whiteheart were brethren who picked up their calling in the early 80’s and they proceeded to release 13 albums until their disbanding in 1997. 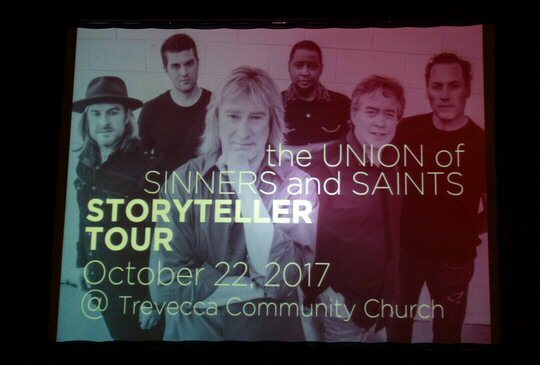 Two principle members from these iconic bands of faith made their way to Mid-Tenn with their new undertaking known as The Union of Sinners and Saints when they played a show in Nashville on October 22, 2017. 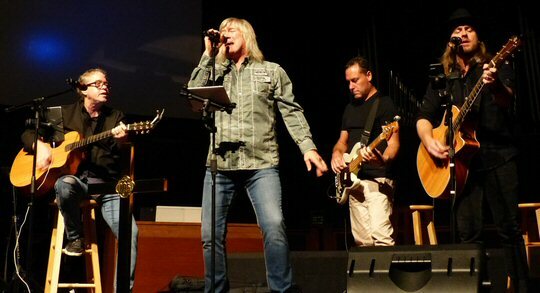 John Schlitt from Petra showed up and gave it his all. At first the setting seemed perfect. Trevecca Nazarene University is a private Christian liberal arts college just miles from the downtown on the Murfressboro Pike. The school’s mission is to function as “a Christian community providing education for leadership and service.” But despite that – in addition to staff and friends of the group – it was a sparse showing on Sunday. Well, empty room does rhyme with empty tomb so there’s that. Nashville is still considered to be a hotbed of the Christian music industry and many of the songs heard on Christian radio are produced here. 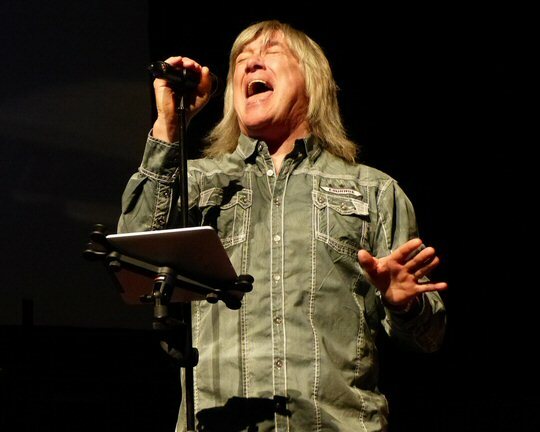 With John Schlitt, lead singer of Petra, and Billy Smiley, guitarist, singer, and founding member of Whiteheart present and accounted for there was nearly a hundred years of real-world experience in ministry and marketing ready to tell their tale. Heck, we found out about the show through a Facebook feed so we were surprised with the low turnout. Had the rapture happened? At several points through the generous two and a half hour performance Schlitt courageously addressed the elephant in the room – or the lack of one. He described that it was difficult to sing to row upon row of vacant seats. And he admitted to those in attendance that this was in fact a “weird” show. But, weird show does not mean bad show and even though not many made the pilgrimage Schlitt and Co. put on a good concert with a story-telling structure that was entertaining, energetic and enlightening. They opened with prayer and proceeded to play a powerful “Rise Up” asking everyone to stand and sing along. 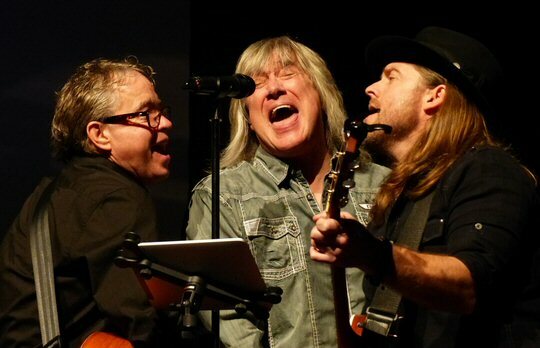 Billy Smiley, John Schlitt and Jason Fowler made their presence known in Nashville. The stage set-up was simple with two acoustics, a bass and keyboard packed in close on the altar of the community church on the college campus. The evening was to feature a cross section of mostly Petra and Whiteheart tracks rounded out with new ones from the debut record from “The Union of Sinners and Saints”. The band has also recently released a new live EP in vinyl format called “Now”. “I Am on the Rock” was another old favorite that was a solid and encouraging word for these increasingly troubling times. The night also included a Petra praise song, “Old Guys Rule” and the appropriate for October “Jekyll & Hyde”. Billy Smiley reimagined several Whiteheart classics while newcomer Jason Fowler testified to the power that helped him turn his life around. While we were still scratching our heads beyond belief that the Nashville faithful were missing out on this free night of music the group closed with a take on Petra’s “Beyond Belief”. For the encore John Schlitt and friends went way back to his secular days to mine some gold from his royal rock bloodline and the Illinois classic rock band that begat his career. Head East had a hit song called “Never Been Any Reason” – and there was no reason for The Union not to play it in Music City. The group is now available for concerts and teaching programs for churches and schools. The “Union” has certainly gotten down to work getting the music and format of their storytellers set just right and the evening was delivered in a professional and friendly manner. Now the guys need to figure out how to get more ears to hear it. The Union of Sinners and Saints appear at Trevecca Nazarene University.